In the “Uber-ized” economy, people are asking for more on-demand service than every before. Convenience-craving customers are always looking for a way to do things better, faster and cheaper. Offering your service with a more flexible schedule and in their chosen location gives you a huge advantage to win their business over traditional options. The key challenges of running a mobile business are irregular hours, traffic headaches and travelling costs but you can definitely make up for them with lower overhead, higher profit margins and a more flexible lifestyle. If you think this might be the perfect route for you as an entrepreneur or a seasoned professional looking to switch things up, here’s some ideas and inspiration. With all these ideas to choose from, you have no excuse not to get started today with your own service business. Busy dog owners only want the best for their furry friends, so when they’re too busy or unable to take them out for some healthy exercise and fresh air, they call in a fellow dog-lover to take the lead. Being able to handle multiple leashes and be a proficient pooper scooper can make your time more profitable. Must love dogs. Whoever said cloth diapers couldn’t be convenient–and user-friendly? Velcro diaper “wraps” replace awkward pins, and pickup and delivery take the dirty work out of diapering. Equipped with a “clean,” propane-fueled delivery truck and some washing machines, you can provide an environmentally friendly alternative to disposables. Talk about changing for the better. Provide pickup and drop-off at a place that’s convenient for busy professionals, then follow suit by arranging with a local dry cleaner to do the actual cleaning.Are you clothes-minded? Then try on the dry-cleaning pickup-and-delivery business for size. You hold the keys to success as a mobile locksmith. For best results, be ready for 24-hour action with a cell phone and van. With some training and basic equipment, you’ll have this business mastered–lock, stock and barrel. Put your service on the road to success by coordinating transportation, food and lodging. Your clients only need to worry about one thing: having fun.Got a taste for adventure? Whether it’s exploring South American caves or touring English teahouses, you’re sure to find a fanatic following . . . so long as you do all the footwork first. Success is close at hand for mobile massage providers. Advertise your stress-relieving services at local workout clubs, spas and physical therapists’ offices. Then bring your trained hands–and a portable massage table–to clients’ homes or places of work. Find an online booking software that allows you to set your travel range so you never have to worry new bookings are too far away. Cook up tasty profits as a personal chef. Those with culinary competence can likely find a hungry clientele among the ranks of America’s busy working families. Or, market your business to clients for those special occasions when they prefer to dine in–complete with restaurant-quality food and service. You can’t beat the legal system . . . as a great resource for business, that is. Private attorneys, who lack the time to do much footwork themselves, often turn to registered court-paper processors to serve their summonses. Come judgment day, you’ll be courting success. A little OCD about organizing? If you’re got a knack for neatness, why not help the organizationally challenged? Messy closets, home offices and commercial offices alike could benefit from a more efficient setup. Put some order into others’ lives, and arrange yourself some pretty profits. Oily driveways, mud-caked semi trucks, or barnacle-ridden boats . . . You name it, and entrepreneurs equipped with specialized power-washing equipment can probably clean it. For spotless results, target commercial as well as residential customers. In today’s computer-based society, computer “downtime” can be both costly and aggravating. As a repair professional–equipped with some basic diagnostic equipment and technological savvy–you can get clients’ computers back up and humming again. Love making videos and have a knack for editing? Turn your hobby, skills and talents into a profit making machine by helping companies and events record and share their stories online and through social media. As video marketing becomes more important, you’ll never have to worry about running out of work. With a limo or a cool rig and some insurance, you could be the driving force behind a new business venture. Stretch your market by adding more drivers and cars to your fleet. Then, once you’ve established a reliable reputation, start driving home your limousine-service sales. Set your roots in a growing business as an office-plant-maintenance entrepreneur. Regular watering, light pruning, and fertilizing are all in a day’s work. Though a green thumb is helpful, some clients may also request maintenance of their silk plants. Either way, your business is sure to grow. Business has never been clearer for window washers. Grab your bucket, squeegee, and glass-cleaning solution, and rap at the dirty windows of local businesses and residences alike. Add repeat customers, and you’ll soon be on a winning streak. If you’re an entrepreneur equipped with specialized power-washing equipment, all you have to do is find oily driveways, mud-caked semi trucks, or barnacle-ridden boats . . . you name it, and some business or person will probably want you to clean it. For spotless results, target commercial as well as residential customers. If it’s broke, you can fix it. Advertise in local newspapers and bulletin boards, then get busy repairing everything from leaky pipes and stopped-up toilets to jammed cabinet drawers and broken windows. Just watch a novice attempt to connect the wires, cables and other components of their new or relocated stereo and television equipment, and you’re likely to view consumer impatience at its finest. But with your sound electrical and wiring expertise, you’ll have all systems buzzing in no time. When push comes to shove, you’ve probably got what it takes to make some “green.” Just roll up your sleeves and start mowing, clipping and fertilizing lawns for office complexes and residential clients alike. Brush up on your painting skills, and get ready to paint the town red–or white, blue or beige, for that matter. Just load up your truck with brushes, rollers and ladders, and get primed for business! Be a mover and shaker with your own local moving service. This is no business for the faint of heart, however: Make sure you’re equipped with some upstanding leveraging techniques . . . as well as brawn. Is there a sitter in the house? If so, homeowners can rest assured that, while they’re away, their plants and pets will be tended to. Don’t wait for opportunity to come knocking; a reliable set of references get you in the door. Lugging pounds of pet food and supplies from the store each week or so can be a burden on pet owners, but it’s certainly not too much for pet-delivery entrepreneurs. Once you’ve sniffed out some leads, start serving up success by delivering pet supplies directly to customers’ doors. Calling all closet-organizing fanatics: It’s time to come out and show your stuff! With a few hooks and shelves, and a lot of creativity (but checking any fear of small spaces at the door), you’ve got the makings of a custom closet-systems pro . . . with plenty of room to grow. New homeowners and long-time closet accumulators alike make up your potential clientele. Not only is residential cleaning a good way to keep a body busy, but it’s also a way to clean up some profits while you’re at it. Start on the ground floor by mopping, sweeping and dusting one house, and work your way up from there! In today’s computer-based society, computer “downtime” can be both costly and aggravating. As a repair professional-equipped with some basic diagnostic equipment and technological savvy-you can get clients’ computers back up and humming again. Do parents a favor and plan their next children’s party. From hiring Sesame Street character look-alikes to coordinating games, decorations and food, you’re sure to be the life of the party by allowing parents to relax and have fun, too. Plan birthday, holiday, and religious-ceremony celebrations . . . and let the festivities begin! Whether you “sit” at your place or theirs, you’ll find busy parents aren’t your only clients; many office complexes, gyms and other businesses need quality child care, too. If there’s one thing that never seems to run out, it’s a kid’s supply of energy. Tap into that vast resource with a children’s fitness program. Put your knowledge of children’s education and physical fitness to the test by renting a location, then coordinate activities such as tumbling, dance, gymnastics and karate. And hop to it! For working and nonworking parents alike, transporting junior to and from school (as well as to after-school activities) can become, well, taxi-ing. By providing a reliable children’s transportation service, you give busy parents a break-and keep their busy kids on schedule. Stairs, cabinets, electrical cords and outlets-they’re all potential baby hazards. New parents, grandparents, and even baby sitters could all benefit from a more kid-friendly house. So grab your tools and be prepared to get down on your hands and knees (it helps to view things from a baby’s perspective). The sector spans services from registered nurses who provide in-home medical treatment, change dressings and end-of-life care, to personal support workers who help with shopping, meal preparation, bathing, companionship and managing medication dosages. It can be around-the-clock care or a few hours a week. Calling all shopaholics: Here’s one business where you can truly shop till you drop . . . without spending a penny of your own! Personal shoppers-who may also perform other errands, such as picking up prescriptions or buying groceries-can never complain about a lack of things to do. As a mobile disc jockey, weddings, parties and other events are all music to your ears. Start jammin’ with a collection of compact discs, a CD player, and a speaker system, then pass on the word about your services to wedding and event planners. Mobile Collectibles Search & Craigslist Agent. Collectibles searchers, who carefully canvas swap meets, thrift stores and garage sales, can collect a bundle locating objets d’art for clients. Once you’ve found your niche–be it antique lunch boxes, dolls or grandfather clocks–advertise your services in hobbyist publications, at collectibles stores, in specialty forums on the internet, or on eBay. Soon you’ll be taking up a collection of your own. Getting married isn’t always as simple as saying, “I do.” There’s a caterer to be contracted, a location to be rented, and flowers to be ordered. So when it comes to making matrimony a more harmonious event for the new couple and their families, wedding planners take the cake. Found something you’re ready to start? 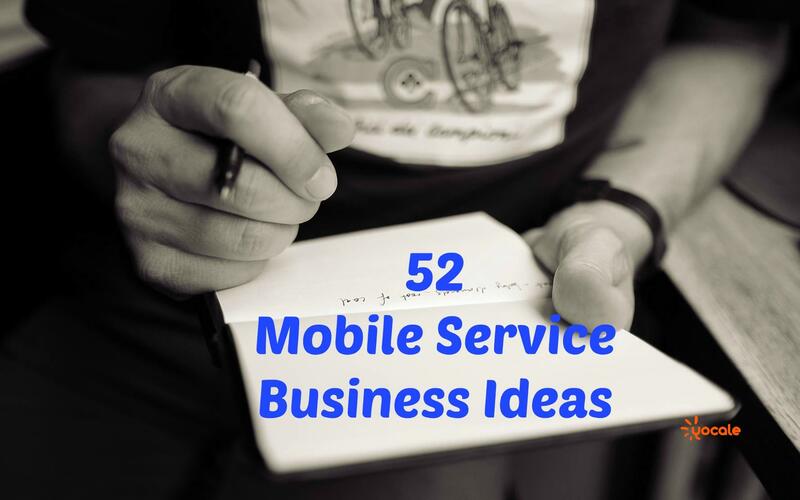 Read “How to Setup a Mobile Service Business” to learn how to get started. Thanks for giving a lot of service in your mobile service business ideas. I impressed about your business and it is a good job. The services are very valuable to me. This is good job after all. Your mobile service business idea one of the inspiration to me. I hope is will be helpful to me for further progress in life and my business. Thanks for sharing this kind of business.